According to Mech, forest health specialist for the Michigan Department of Natural Resources Forest Resources Division, oak wilt is a serious disease of oak trees. It mainly affects red oaks, including northern red oak, black oak and pin oak. Red oaks often die within a few weeks after becoming infected. White oaks are more resistant; therefore, the disease progresses more slowly. “The normal time-tested advice is to prevent oak wilt by not pruning or otherwise ‘injuring’ oaks from April 15 to July 15,” Mech said. He added that the spread of oak wilt occurs during this time of year as beetles move spores from fungal fruiting structures on the trees killed last year by oak wilt to wounds on healthy oaks. As warmer weather melts away snow and ice, the beetles that move oak wilt become active. Unfortunately, many people learn not to prune or otherwise wound trees from mid-April to mid-July only after they lose their oaks to oak wilt, he said. 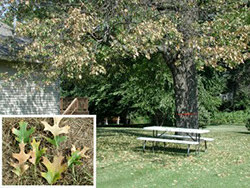 Although oak wilt hasn’t been detected in every Michigan county, Mech said the need for vigilance is present statewide. Spring is a popular time for people to move firewood to vacation properties and other locations. During this April-to-July period, Mech said it’s vital not to move wood from oak wilt-killed trees. These trees often are cut into firewood and moved, sometimes many miles from their original locations. Any wounding of oaks in this new location can result in new oak wilt infections as beetles move spores from the diseased firewood to fresh wounds on otherwise healthy trees. “With the transport of firewood and other tree-related activities, you have to assume the risk is present, whether you live in metro Detroit or in the Upper Peninsula,” Mech said. The DNR recommends that anyone who suspects they have oak wilt-tainted firewood should cover it with a plastic tarp all the way to the ground, leaving no openings. This keeps the beetles away and generates heat inside the tarp, helping to destroy the fungus. Once the bark loosens on the firewood, the disease can no longer be spread. New oak wilt sites have been traced to spring and early summer wounding from tree-climbing spikes, rights-of-way pruning, nailing signs on trees and accidental tree-barking (a wound created when bark is removed via impact from equipment, falling trees and other causes). If an oak is wounded during this critical time, the DNR advises residents to cover the wound immediately with either a tree-wound paint or a latex paint to help keep beetles away. Once an oak is infected, the fungus moves to neighboring red oaks through root grafts. Oaks within approximately 100 feet of each other – depending on the size of the trees – have connected or grafted root systems. Left untreated, oak wilt will continue to move from tree to tree, progressively killing more red oak over an increasingly larger area. As more trees die from oak wilt, more spores are produced which contribute to the overland spread of oak wilt. To minimize the risk of oak wilt infection caused by logging damage, DNR prohibits cutting of red oak trees on state-managed land between April 15 and July 15. This helps protect red oak trees left after thinning from damage that could lead to infection. The DNR recommends private forest landowners exercise caution during this period and, whenever possible, delay harvesting activity in oak forests until after July 15 to reduce the risk of oak wilt. Visit the DNR website for more information on the background, symptoms and prevention of oak wilt, or visithttp://na.fs.fed.us/pubs/howtos/ht_oakwilt/identify_prevent_and_control_oak_wilt_print.pdf. To report a suspected oak wilt site, email DNR-FRD-Forest-Health@michigan.gov or call 517-284-5895. Learn more about oak wilt and other forest health issues in Michigan at www.michigan.gov/foresthealth.